Carp angling kit is something to be proud of and may take many years to achieve. Personally i have to use the right kit or nothing. Whether it be rods, reels or bite alarms I try to always use the best. For me Delkim alarms are the best, if anything there probably far more advanced than any other on the market. I use the Tx-i versions with the sounder box and they have never let me down, even in the harshest of conditions. The good old British weather throws everything at us throughout the four seasons. I fish every month of the year for short weekend trips in all weather and my alarms are true testament to the Delkim brand. The clever boffins at Delkim have thought of every eventuality to do with a real carpers needs. All the boxes are ticked in respect of what ever style of carpin you are doing. With a massive sensitivity range these buzzers will cover all aspects required. I make use of the sounder box every time i fish. I literally turn all the buzzers volume down to zero noise and just have the sounder box on. This helps no end if you like to fish at close quarters and do not want to spook carp out of your swim. Vibration from a buzzer can transmit the noise down the line alarming your quarry. So this feature alone wins my vote hands down. There are simply far too many features to mention in this piece. I would recomend you take a look at the spec sheets covering this on the web page. Mind blowing, considering I have fished for thirty years in the carp game and think back to what we used then. I am sure which ever Delkim alarm you purchase you will be on to a winner. 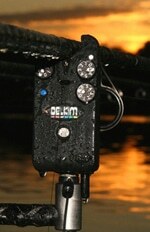 Most of the anglers i know in the game are pretty serious about what they use and they all use Delkim. All the very best in your angling and may all your runs be thirties, green army.